I had intended to write on a different topic this weekend, but I made the mistake of looking at Facebook, saw this link to an article in The Guardian about Dorothy Dunnett’s Lymond Chronicles, and got derailed. My Georgia Tech roommate introduced me to the Lymond Chronicles years ago. (Thanks, Letha!) The six books in the series, historical novels following ten years in the life of the fictional 16th-century Scottish nobleman, Francis Crawford of Lymond, are packed with action, drama, romance, and vivid characters. They are the best historical novels I’ve ever read, and I’ve read a few. It’s fair to say I love them; my husband and daughter don’t. Sigh. The reasons for our different reactions is at least partly due to how we approach a novel. My husband reads slowly and thoroughly, and hardly ever re-reads a novel. He wants to understand everything as he goes along, and in these stories, that’s not easy. Besides the indirections the author throws in around the central mystery, the books are littered with phrases and verses in foreign languages and allusions to 16th-century or older literature, all appropriate to the well-educated aristocrat Lymond represents. They are also crowded with dozens of real historical figures. Even with The Dorothy Dunnett Companion at hand, trying to keep track of who’s who or what this character meant by that quote is difficult, and seriously annoyed my dear husband. This swashbuckling epic sweeps across Europe and the Levant, taking in Tudor England, France, Malta, and the Russia of Ivan the Terrible. Saying a novel or movie brings history to life is such a cliché, but in this case it seems fitting. I’m left with memories of living, breathing, human beings. Some books are instantly forgettable; a week later it’s hard to remember any details. This series is the opposite; nearly forty years after I first read them, a mere mention of them evokes a flood of vivid images, among them a chase across the rooftops of Paris, a grim card game with a man’s life and reputation at stake, a chaste and uncomfortable night in Suleiman the Magnificent’s seraglio, and a brilliantly-narrated sword fight* between two brothers. And that scene where Lymond, arrow nocked and bow drawn, is determined to stop a man carrying a deadly message. He stands unmoving, waiting for a clear shot, despite seeing another man with an arquebus closing in on him. Who will get the first shot? Will either hit their target? 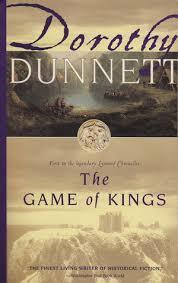 Read The Game of Kings and find out. *That sword fight was in the first book she ever wrote! These are the kinds of books that make us lesser mortals aspire to try our own hand at writing historical fiction, at the same time leaving us in despair that we could ever be good enough in a genre where the bar has just been cranked out of reach.